Simon Desbruslais leads these premiere recordings of works by some of the UK’s leading composers. Seeking to expand the repertoire for trumpet and orchestra, he was inspired after performing Robert Saxton’s Psalm to help commission the three remaining works on this programme: Saxton’s Shakespeare Scenes, Deborah Pritchard’s Skyspace and John McCabe’s La primavera. The Trumpet Concerto La Primavera is so-called because the initial impulse for the piece came from considering two aspects of the coming of Spring: the exuberance and vitality of burgeoning new growth, and the flowering (literally!) of the new or refreshed life as it expands. So the opening quick movement’s music is quicksilver and mercurial, with much celebratory material as well as overlapping patterns and a gradual increase in density—though there are also moments of chamber-music writing as well. In the central slow section which follows without a break, there is at first an almost static mood, inner life staying below the surface, until at length a complex theme rises, initially, from cellos and basses and eventually provides a full string texture. This is linked to the final quick section by a short 'quasi cadenza' for the trumpet solo and bongos, and in the finale the music is rhythmic, once again accumulating through the juxtaposition of various overlapping strands. At the close, the trumpet solo has the last word (or the last note). Two aspects of the instrumentation should be mentioned. One is that for the slow section, the soloist uses a Flugelhorn, that beautiful instrument beloved of brass bands and treated symphonically with great respect and sympathy by Vaughan Williams—it was also the instrument employed by Miles Davis, another musician whom I greatly admire. In the slow section, the music pays what I hope is a discreet homage to his jazz style. The other point concerns the percussion, which in a note in the score is requested to be placed, if possible, at the front of the platform next to, or near, the trumpet soloist, since thepercussion part is at times in the nature of an obbligato. The concerto was commissioned by the Orchestra of the Swan, and is dedicated to Simon Desbruslais, who initiated the composition, and to Robert Saxton and Tessa Cahill, whose encouragement provided the starting-point for this composition. The first performance was given by Simon Desbruslais and the Orchestra of the Swan, conducted by Kenneth Woods, in the Civic Hall, Stratford-upon-Avon on 15 June 2012. From its inception, this recording has been entwined with my graduate studies. Fresh from the Royal College of Music in 2007, I matriculated at the University of Oxford to begin a doctoral thesis in musicology. During this time I encountered the music of Oxford professor Robert Saxton, who, it transpired, had written a trumpet concerto Psalm: A Song of Ascents in 1992. At this formative stage of my career, I was determined that I wanted to combine solo performance with academia, and the opportunity to bring British music to life—by performing marginalised works and commissioning new ones—was strongly appealing. 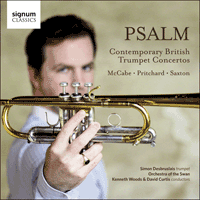 It was following a performance of Psalm in 2008, with the Oxford Sinfonietta, that I ﬁrst approached Robert with the idea to write a new trumpet concerto. Why stop at one, I thought? Robert’s trumpet writing and musical language immediately appealed to me. It had such raw energy, complexity and yet cohesive structural identity. As a trumpeter, it gave me everything that I was looking for in a concerto, including technical challenges in generous measure. The following events surpassed my every expectation: three new stunning trumpet concertos written for me by three of Britain’s ﬁnest composers. Deborah Pritchard’s Skyspace is one of the ﬁrst modern concertos to be conceived solely for piccolo trumpet. Though a popular instrument, it has thus far been surprisingly restricted to concerto performances of earlier baroque concertos and transcriptions. This is despite its wonderful treatment in the symphony orchestra: Messiaen’s Turangalîla Symphony or Britten’s Four Sea Interludes, for example. Deborah’s music maintains vivid and direct relationships with visual and conceptual art, placing her work within a fascinating, rich interdisciplinary context. John McCabe’s La Primavera is a tour de force of orchestral writing and thematic development, including one of the most beautiful and expressive ﬂugelhorn parts in the repertoire. The combination of spring themes and pictorial references to sporting events (it was written in 2012, year of the London Olympics) makes for a truly effervescent musical experience. Finally, Robert’s Shakespeare Scenes places the trumpeter within an unusually explicit, dramatic role: as Puck, Falstaff, King Lear and Prospero. The opportunity to engage with these characters is a delight which is certain to reward trumpeters for countless generations. The trumpet is ideally suited to the concerto. Indeed, many orchestral works exploit its ability to dominate an entire body of musicians, such as Mahler’s Fifth Symphony or Scriabin’s Poem of Ecstasy. Though it has much unexplored potential in the ﬁeld of chamber music, it is most dominant in the concerto. Unfortunately, we are missing at least one hundred years of concertos, from the Hummel trumpet concerto of 1803, to the French trumpet concertos of the early twentieth century. This recording represents the beginning, not the end, of my trumpet mission: to expand the repertoire and make amends for those lost years. I hope that it offers an insight into the wonderful array of contemporary music making in the United Kingdom, and a window onto some of the myriad possibilities the trumpet can offer. Welcome to the ﬁrst chapter of our journey together.